In a look back at 2010, VVVVVV creator Terry Cavanagh reveals that the world of independent development isn't all unicorns and rainbows. With the enthusiasm and amazing creativity coming out of the independent videogame development scene today, sometimes it's hard to realize that there's still a lot of blood, sweat, and tears behind each release. On VVVVVV creator Terry Cavanagh's blog, he recently offered a realistic perspective behind indie game development, and revealed that he nearly faltered until VVVVVV came along. 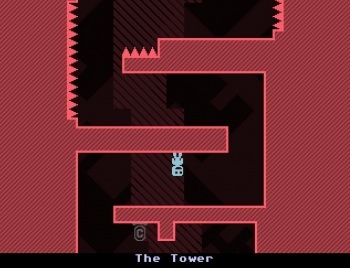 Despite garnering a strong following by creating titles such as Don't Look Back, Cavanagh says that things were looking bleak before the release of VVVVVV in January 2010. Cavanagh had taken out a €15,000 ($20,000) loan in 2008, ran out of money in a year, and was forced to go on unemployment for six months. By November 2009, he was flat broke, his credit cards were maxed out, his bank account was overdrawn, and he moved back in with his parents while taking out loans from friends and family to make ends meet. Meanwhile, VVVVVV, once a side project, was ballooning. Cavanagh thought it'd be his final project as a full-time independent game developer, and wanted to make it good. In a way, it almost seems like Cavanagh's hardship translated into VVVVVV's development quality. Cavanagh admits that he may have made a "mess" of VVVVVV's release, including a "misjudged" original price of $15, but despite this "fumbling" and the game's limited distribution through Cavanagh's website and Kongregate, it was a success. VVVVVV sold 312 copies in one day, almost 2000 in a month, and 3000 by the time it was released on Steam in September 2010 with a price reduction to $5. He's not able to share Steam sales figures, but says VVVVVV has been doing well on the platform. Cavanagh was able to pay back his debt and is now back on track as a full-time independent developer. Cavanagh's current project is an ambitious, alternate-history RPG called Nexus City. Despite the chunk of change he's earned from VVVVVV, Cavanagh is happier about the simple fact that he can still make a living by developing games. His story is yet another example of how smaller operations are carving out a significant niche in the videogame industry by the skin of their noses.